Also serving communities of Olympia Fields, Lansing. There are 23 Assisted Living Facilities in the Crete area, with 2 in Crete and 21 nearby. To help you with your search, browse the 180 reviews below for assisted living facilities in Crete. On average, consumers rate assisted living in Crete 4.3 out of 5 stars. Better rated regions include Chicago Heights with an average rating of 4.3 out of 5 stars. Caring.com has helped thousands of families find high-quality senior care. To speak with one of our Family Advisors about assisted living options and costs in Crete, call (855) 863-8283. Promotion ends in 286 days! Despite being located just 35 miles south of Chicago, the village of Crete, Illinois, is home to forest preserves, golf courses and equestrian facilities that give it a semi-rural feel. About 8,000 people call Crete home, and nearly 19 percent of them are seniors. There are 23 assisted living facilities located in and around Crete to accommodate the population. Assisted living facilities in Crete must follow Illinois law, which mandates certain staffing requirements and other health and safety measures. The Illinois Department of Public Health is responsible for licensing and overseeing these facilities. Crete is generally an affordable place to live. Seniors who move there can expect to pay less in grocery costs than average, with Crete's prices ranking at about 94 compared to the Illinois average of 97 and the U.S. average of 100. Health spending is right at the national average of 100, and transportation costs are slightly higher at 106. Seniors on a fixed budget may also benefit from the state's retirement-friendly tax policies. Social Security, pensions and withdrawals from retirement accounts are generally tax-exempt in the state. Crete's crime rate is fairly average for the state of Illinois. Residents have about a 1 in 59 chance of becoming the victim of a property crime, while citizens across the state have a 1 in 50 chance. Crete is safer than 33 percent of cities across the United States. The weather in Crete tends to be moderate, although winters can be cold with lows in the mid-teens. It gets about 26 inches of snow a year, which may make it difficult for seniors to walk or enjoy outdoor activities during the winter. Summer highs tend to be in the 80s. Crete has no/few facilities from which to choose in the event of a medical emergency or illness, with the nearest major hospitals located in Flossmoor and Olympia Fields. The American Lung Association has given Will County, which includes Crete, a "B" rating. Seniors with respiratory issues may need to occasionally stay indoors on high ozone days, but the air is generally safe. Assisted Living costs in Crete start around $0 per month on average, while the nationwide average cost of assisted living is $4,000 per month, according to the latest figures from Genworth’s Cost of Care Survey. It’s important to note that assisted living rates in Crete and the surrounding suburbs can vary widely based on factors such as location, the level of care needed, apartment size and the types of amenities offered at each community. 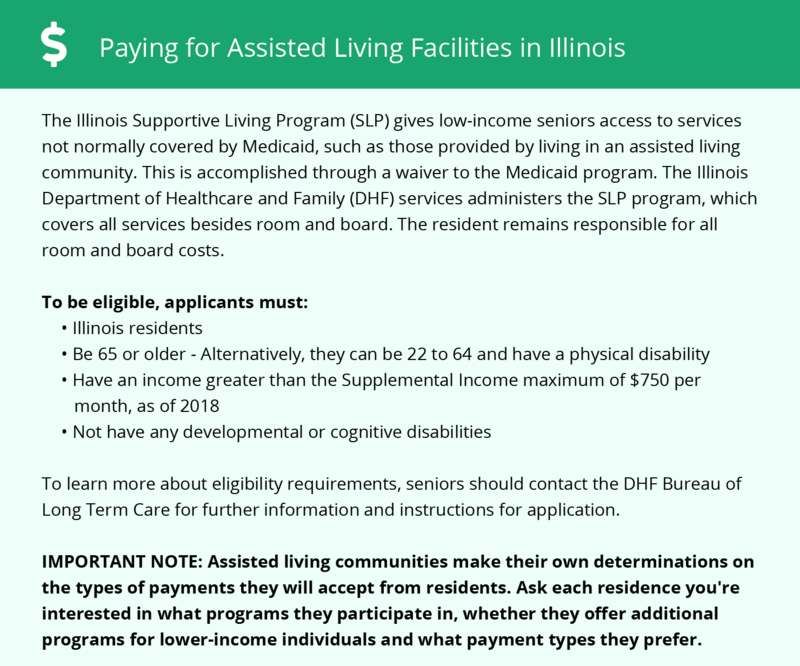 Seniors in Crete who are eligible for Medicaid may qualify for the Illinois Supportive Living Program, which pays for some expenses related to assisted living. Other low-income seniors may qualify for the Illinois Community Care Program for similar assistance. Crete and the surrounding area are home to numerous government agencies and non-profit organizations offering help for seniors searching for or currently residing in an assisted living community. These organizations can also provide assistance in a number of other eldercare services such as geriatric care management, elder law advice, estate planning, finding home care and health and wellness programs. To see a list of free assisted living resources in Crete, please visit our Assisted Living in Illinois page. Crete-area assisted living communities must adhere to the comprehensive set of state laws and regulations that all assisted living communities in Illinois are required to follow. Visit our Assisted Living in Illinois page for more information about these laws.